HONG KONG, China, January 24, 2014 (ENS) – The Hong Kong government has decided to destroy one of the world’s largest ivory stockpiles as a deterrent to poachers who kill up to 96 elephants a day across Africa. Acting against a centuries-old tradition of carving ivory into religious objects, the Endangered Species Advisory Committee of the Agriculture, Fisheries and Conservation Department voted Thursday to burn 27 metric tonnes of its estimated 33 tonnes of confiscated ivory. The Endangered Species Advisory Committee said after Thursday’s meeting that its members were unanimous in their approval of the department’s proposal to dispose of forfeited ivory in the government stockpile. Apart from retaining a small amount of ivory for potential uses permitted by the Convention on International Trade in Endangered Species, CITES, all the forfeited ivory stockpile will be disposed of by incineration. The Agriculture, Fisheries and Conservation Department, AFCD, will work out an implementation plan. It is expected that the disposal can start in the first half of 2014 and be completed in about one to two years. All species of elephant were listed in 1989 under CITES Appendix I, which prohibits international commercial trade. Use of specimens of endangered species for scientific, enforcement, identification and education purposes is allowed under the CITES guidelines. In case use for such purposes is not practical, keeping the specimens in storage or disposal by destruction is also permitted. But, “In view of the management burden and the security risk generated by prolonged storage of the forfeited ivory stockpile,” the AFCD said it is necessary to dispose of the confiscated ivory by destruction. This decision follows an ivory demand reduction public awareness campaign by nongovernmental organizations that features Chinese celebrities such as actress Li Bingbing and former basketball star Yao Ming, speaking out about the horrors and consequences of the ivory trade. 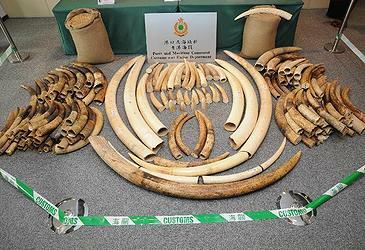 “The public destruction of Hong Kong’s stockpile will raise awareness among ivory collectors and those who aspire to own ivory that their coveted product has a dark side, one that is connected to wholesale elephant slaughter, civil unrest, terrorism, and a complex supply network of criminals and corrupted officials,” said Bergin. Hong Kong’s decision follows China’s destruction earlier this month of six tonnes of illegal ivory, a part of the country’s stockpile, to deter elephant poachers. Will Travers OBE, chief executive of the international nonprofit Born Free Foundation, said Hong Kong’s decision is important. Travers outlined a series of actions the international community needs to take to ensure elephant survival. “Close domestic markets – no more selling ivory. Support Africa’s conservationists and the rangers in the field to make sure they get the training, equipment and support they need to protect elephants from the poachers. Use our global intelligence-gathering machinery to infiltrate and destroy the criminal syndicates that are behind the bloody slaughter. Stop the poaching of elephants and the selling of ivory providing funds for militant and terrorist organizations determined to destabilize communities far and wide,” he said. Travers said Hong Kong’s decision could act as a catalyst for further action by the UK government, when the UK hosts a High Level Meeting on Illegal Wildlife Crime in three weeks. “Put serious funding from our Overseas Aid Budget behind the African Elephant Action Plan and support the rangers who risk their lives, daily, to protect Africa’s wildlife heritage,” Travers advised. The amount of ivory seized globally in 2013 was over 44 tons, the highest in more than 25 years.